Description: I THINK this was at Rocky Mount, taken a long time ago. Description: Outlawed at old CP-10. Description: This will be the leader of Q-437's power today. Later wyed on the station track. This is Nevin's yard. 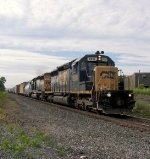 Description: A pair of CSX units work the north end of Radnor Yard in Nashville. Description: Crossing the Etowah River. Description: Q293 slowly passes the Chester Rail Museum as it climbs Washington Hill. Description: Q293 approaches Lower Valley Road in Becket. Description: Southbound B749 with a Beacon recrewed Q431. Description: Westbound on the Lake Shore sub. Description: SD40-2's 8839 and 8841 along with a GP40-2 sit shut down with their train while the first brand new BL20GH for MNCR/CDOT sits in the background awaiting pickup. 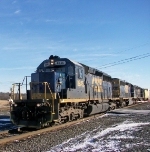 Description: SD40-2 in "dark future" color leading a "bright future" SD40-2 north towards Massena Yard. 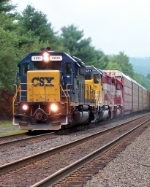 Description: CSX SD40-2 8839 trails on G102 South. 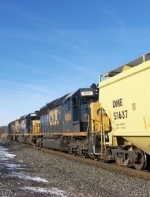 Description: Northbound grain train waits at Tilton for grade crossing construction work.